Contractors and their payroll administrators who deal with employees who work on more than one job or project during a single workweek, with different wage rates for each job OR perform work under more than one type of work/trade classification in a single workweek, with different wage rates for each work classification also want software that will automatically calculate and distribute overtime hours worked for all employees, on all jobs, for any given work week - relieving them of the time-consuming and error-prone process caused by manual calculations and timecard entry. While all employers are subject to" normal" overtime laws that require payment of overtime for hours actually worked in excess of 40 hours per week (sometimes when more than 8 hours are worked in a day); with overtime to be paid at one and one-half (1.5) times the average regular rate of pay: an increasing number of states are adopting the Federal Weighted-Average Overtime Rules, administered by the Fair Labor Standards Act (FLSA) and forcing employers in the construction, healthcare, and manufacturing industries to comply with these additional requirements. 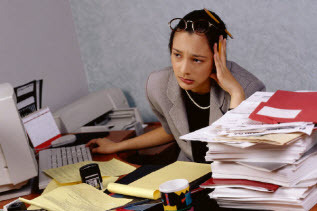 The Fair Labor Standards Act (FLSA) states that when an employee works on two or more jobs at different rates of pay OR two or more work/trade classifications at different rates of pay, for the same employer, in the same workweek; weighted-average overtime is owed on hours worked over 40 in the workweek. Manually applying and calculating this mathematical equation for multiple employees each week is an extremely time-consuming and error-prone task; often resulting in payroll errors, which must be done before time can be entered for job costing purposes and payroll can be processed in QuickBooks - this causes a great deal of frustration and dissatisfaction for QuickBooks users. Having an automated process in place for this critical task will help you be more productive, eliminate the error-prone process of manual overtime and weighted-average overtime calculations, and allow you to easily comply with BOTH State Overtime rules and FLSA requirements. Crew/Overtime Entry Solution (COES) has been designed to specifically increase your accuracy, save you time, and automate the timecard and overtime calculation and entry process. You can teach the program about the Overtime laws that your state requires you to follow. You can create "crews or groups" of employees. Employees can be assigned to the same group multiple times with different ratess of pay OR employees can be assigned to multiple crews. You can enter time by crew, by job, by day; using ALL straight time hours - and post this back to your QuickBooks Weekly Timesheet. You can enter timecards for hundreds of employees with a few clicks of your mouse. You will no longer need to manually calculate or enter Overtime or Double time hours worked by each employee. Create a paid Holiday schedule and have COES enter paid holidays automatically. "Weighted-Average" overtime can be automatically calculated by choosing one of four different calculation methods and added to each employee's timesheet at the end of the week. You can eliminate the need to manually update employee rates of pay by setting "defaults" in Crew/Overtime Entry Solution. Teach Crew/Overtime Entry Solution (COES) about the overtime laws as they relate to your state. Choose one of four different ways in which the program can calculate and distribute overtime/weighted-average overtime. Make sure that your QuickBooks Payroll Item List is set up in a manner that Crew/Overtime Entry Solution can accurately do its job. Set up "crews" in the COES software. Enter timecards for the crews you set up, by job, by day in COES - using all straight time hours and pay rates, then post this information to the QuickBooks Weekly Timesheet - you can enter time for hundreds of employees with just a few mouse clicks. At the end of the week, retrieve your QuickBooks Weekly Timesheets and COES will perform overtime/weighted-average overtime calculations for you, and then post the revised information back to QuickBooks in minutes, so you can process your payroll. How does Crew/Overtime Entry Solution Work? Watch this 10-minute video to find out. Priced at $395.00 for a Crew/Overtime Entry Solution company license; with the program to be installed on as many computers as necessary, via electronic download, see our Order Page for more details. Complete setup instructions are offered in a variety of learning methods: Audio/Video Training, self-paced training, comprehensive manuals, in-program help, or purchased training contracts. 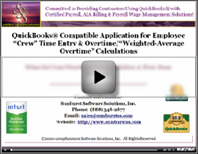 Download a pdf Crew/Overtime Entry Solution brochure (387 KB) . To view commonly asked questions; please go to our Frequently Asked Questions page, for other documentation, please visit the folder Crew/Overtime Entry Solution Training, Support & Resource Center .